Track-A-Demia is an ongoing music series that uses popular and underground tracks to explore the nature of current news headlines and buzz. It’s an informal crash course on viewing the world through song. This Monday, January 16th, 2017, marks the 34th year since the Martin Luther King Day federal holiday was officially signed into American legislation. The decision finally arrived after decades worth of campaigning and persuading that dates all the way back to 1968, the year that King was assassinated. It was the combination of his revolutionary life and untimely death that propelled the reverend and activist’s image into martyrdom. 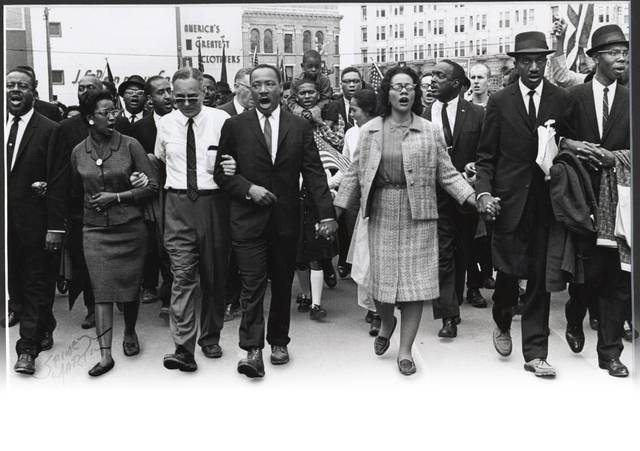 King was literally the face of the Civil Rights movement of the 1960s. His sermons, speeches, and dedication to a non-violent philosophy of protest earned both he and the movement national attention, accolade, and, unfortunately, racist backlash. When Dr. King was killed, the act was a wound felt all across the country by black, white, brown, working-class, rich, and poor alike. Poets, artists, and, of course, musicians could not help but to honor their sentiments and pay homage to the slain peace-maker. Many, like Stevie Wonder, electronic duo Moodswings, and even The Game, even years after, have found ways to incorporate Dr. King’s legacy into their music. This edition of Track-A-Demia is dedicated to odes from those aforementioned artists and more. No stranger to the struggle for freedom, equality, and the personal right to be one of the most beautifully complex musicians of recent times, is revered songstress Nina Simone. Long heralded for her uplifting ballads just as much as for her darker or more solemn compositions, Ms. Simone’s body of music is as dynamic as it is popular. The High Priestess of Soul’s 1968 song “Why The King of Love is Dead” is her solemn reaction to Dr. King’s death. Of all the musicians that contributed towards honoring MLK’s legacy, it is perhaps Stevie Wonder who deserves the most credit for becoming the tipping point that finally led to a federal holiday that officially honors the activist. Recorded in 1980, “Happy Birthday” was a conspired tune that Wonder used to convince America and its politicians by singing exactly what his thoughts on the matter were: “I just never understood / How a man who died for good / Could not have a day that would / Be set aside for his recognition.” Stevie then followed up the song’s popularity with a Rally for Peace Conference in the same year. Shortly thereafter—1983 to be exact—President Ronald Reagan signed Martin Luther King Jr. Day into law. 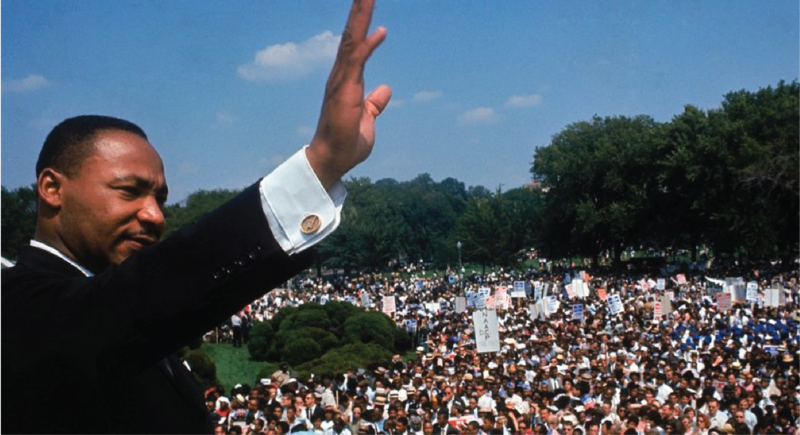 Despite the universal message of peace and unity among people of all colors, Dr. Martin Luther King’s philosophy was unfortunately not accepted by all Americans. Even after his assassination, a deed so foul and racially motivated, pockets of that same hatred and bigotry continued to oppose his work, despite federal mandate. The people in power of particular states still refused to accept the legacy of a black man as a federal holiday. In 1991, social justice-driven hip-hop group, Public Enemy, faced some of this insubordination head on with their track “By The Time I Get To Arizona.” The tune took direct aim at then Arizona governor Evan Mecham and called him out on his racist sentiments and actions. The politician had reversed the decision to make MLK Day a paid holiday in the state when he took office in 1987. It wasn’t until 1992 that it was finally instated and accepted for good in Arizona. Los Angeles MC The Game’s third studio album LAX features the song “Letter To The King” as its closing track. The Hi-Tek-produced track features him and guest lyricist Nas trading their wordsmith abilities in homage to MLK. The two cleverly parlay their way across some very strong poetry about King’s legacy and how it affects their modern, everyday experience in America as black men. British electronic duo Moodswings has perhaps the most abstract ode to Dr. King’s legacy in this list with their 1992 track “Spiritual High Part III.” Though not necessarily out of this world in having sampled King’s “I Have a Dream” speech, where the tune does go on the more ethereal tangent is its dreamlike and percussive production, an expansion on the British boom-bap of the early ’90s. Think breakthrough British R&B group Soul II Soul, but on a more transcendental frequency.